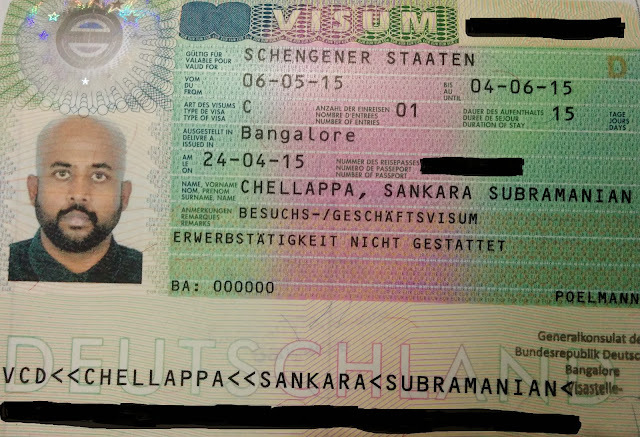 Schengen Business Visa for Indians through Germany Consulate - Be On The Road | Live your Travel Dream! Are you planning on applying for the Schengen Business visa through the Germany consulate? Well, if you are, you would be happy to know that I recently applied for mine and got it easily. The process was fairly simple and straightforward as long as you have the documentation. All you have to do is fill up the online form, take print outs of it, keep all documentation ready, submit all the papers at your nearest VFS office, pay the fees and wait for your passport to be stamped. I applied for mine at the VFS office in Bangalore and got my visa in 2 days through the German consulate in Bangalore. All transactions take place through VFS, who is the authorized visa service provider. Even if you go through a travel agent, they in turn will go through the applicable VFS office. The duration and validity of visa depends on the embassy’s discretion and varies from case to case. 13) Covering letter from your office or yourself on your overall plan and mentioning all the documents that you have attached with the application. Visa Fee = INR 4100. Generally, they say 7 to 15 days, but one usually gets their visa in 3 days at Bangalore. All payments need to be made by cash at the VFS office. Once you have paid, you get a tracking number through which you can track the status of your application. If it is ready, you can either collect it from VFS or wait for it to be couriered to your address.